Do you need them repaired as quick as possible? Call us, we can fix them promptly and professionally! Your Dentures can often be repaired in the sameday or as little as two hours depending on the nature of the break and how busy we are. We'll do our best to minimise the embarrassment and discomfort of not having your teeth any longer than need be. Dentures usually break for a reason but persisting with old dentures well beyond their use by date is one of the main causes. Dentures should be relined after 4 years and replaced after 8 years and sometimes even less, depending on your teeth grinding habits. 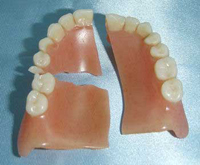 Dentures repairs require a specialised repair process. Before we can touch them (and after the repair), the denture must be thoroughly cleaned and soaked in appropriate cleaning agents.Full Infection Control Guidelines are in place - not only for your safety but for ours as well.